British Columbia-based non-profit organization SuperChefs Cookery for Kids has been named one of five finalists for the renowned 2018 Partnership for a Healthier America (PHA) Catalyst for Change, Impact Award. SuperChefs is the only Canadian organization named as a finalist for their ground-breaking work to empower and inspire kids to make healthier choices, train prospective healthcare and culinary students to use fun food and cooking skills with kids, and to create and guide healthier kid-friendly menus for the Westin Hotels and Resorts chain in over 200 properties worldwide. collaborating with childhood organizations to generate better results. PHA was created in conjunction with – but independent from – Former First Lady Michelle Obama’s Let’s Move! effort. This is the 3rd year the award celebration has occurred and Former First Lady Michelle Obama continues to be Honorary Chair of the Partnership for a Healthier America. 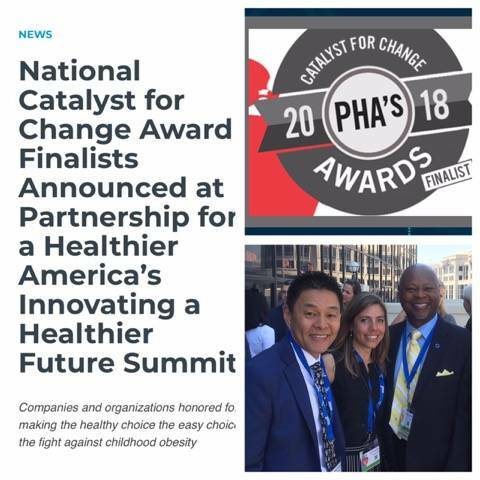 Finalists were announced during the 2018 Innovating a Healthier Future Summit on May 3 and winners will be announced at the PHA Fit to Celebrate Gala on September 27th, 2018. We have provided a model for hotels around the world to bring kids into their kitchens, holding SuperChefs events to promote wellness and healthy choices in their communities.